2007 Monaco Cayman XL 36PDQ (Only 36’ Model w/4-Slides) 325HP ISB Cummins Diesel Motor with Exhaust Brake & ONLY 4,065 Original Miles! Stacked Aluminum charged Air Cooler, Aluminum Radiator, and external Aluminum Transmission Cooler for Optimum Heat Transfer and Cooling. Roadmaster RR4R Raised Rail Chassis-2 Pass through Storage Compartments w/a Slide Tray, 2,500 Allison Auto 6 Sp. Transmission, New Tires & New Batteries, 8K Onan Gen. w/24 Hrs., Hydraulic Auto Leveling System, 7K Tow Rating, 1 Piece Windshield, 2,000 Watt Inverter, Power Patio & Entry Awnings, Manual Window Awnings, Auto Sun Shades, Central Vacuum System, Newer 30” Sharp Front Flat Screen TV, DVD Player & CD Player. Cruise Control & 6-way Power Driver’s Optima-Leather Seat, 3 Way Back-Up Camera System w/Audio, Full Body Paint, 3M Film Front Mask, Chrome Heated Exterior Mirrors & Stationary King Dome Satellite. RV is in Like New Condition! Additional Upgrades Include: Stainless Steel Space-saver Microwave and Refrigerator, Upgraded Satin Nickel on Bath Hardware and Cabinet Pulls; Upgraded Satin Nickel Wall Sconces; Bath Lavatory and Dinette Light; Armstrong Laminate Floor with Runner between Entry Tile and Kitchen Tile; Corian Backsplash IPO Mirror Application, Fantastic 12V Attic Fan with Rain Sensor with Electronic Wall Thermostat in Bath; Wood Louver Air Return Grill for Furnace IPO Metal Air Return Grill; Eclipse Automatic Poly-Weave Patio Awning. Optima-Leather Euro-Recliner with Heat, Massage and Ottoman IPO Fabric Swivel Glider Barrel Chair, Optima-Leather Hide-A-Bed Sofa with Air Mattress and Two Pillows. 2000-Watt Inverter with Two Additional Batteries, 4 Total 6 Volt Batteries Manual Retracting Power Cord Reel, Onan 8.0 kW Quiet Diesel Generator. Dual 13.5M BTU Air Conditioners with Heat Pumps and Digital Thermostat Control Ceiling Fan in Bedroom Fantastic 12V Attic Fan with Rain Sensor with Electronic Wall Thermostat Kitchen. RV was Garaged for 8 Years following the 1st owner’s death 6 months after purchasing this RV. 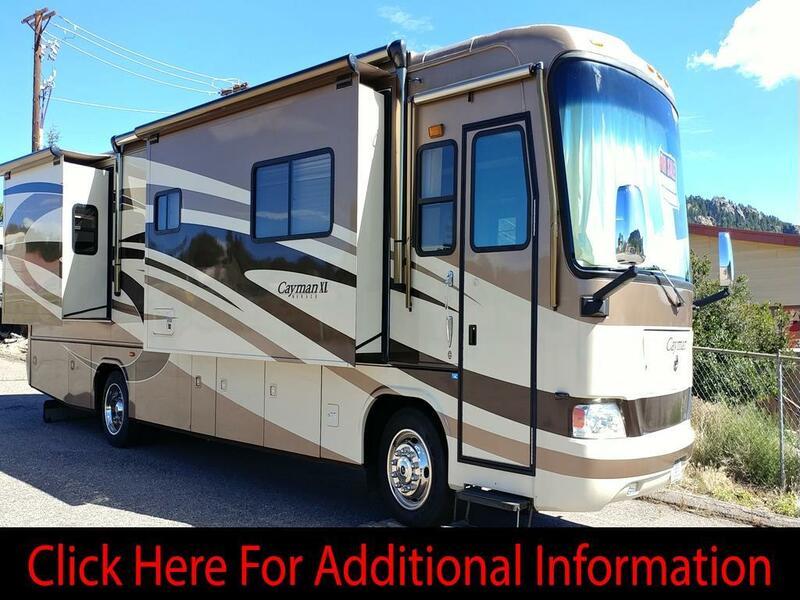 The Current Owner just doesn’t have the time to use the RV so it’s time for this coach to stretch its legs with a new owner. There are some minor scratches in the paint and the rear bumper has had some minor repair but over all this RV is in like New Condition. Whoever comes to buyer this RV will not be disappointed! You just don’t find 2007 RVs with only 4,065 Miles on Them! Vin: 1RF21444672044117 Looking for Financing-Contact Dana Zimmerman at Credit Union of Denver 303-239-118four. Message: Thought you might be interested in this 2007 Monaco Cayman.